I recently found myself in possession of nearly thirty pounds of Alaskan grizzly bear meat, along with several bottles of Boulevard Brewing Company’s Sixth Glass Belgian Quad. I then realized there was a serious lack of smoked sausage in this household, so I set off to find a beer and bear fueled solution to this problem. What I ended up with is a smoked sausage with a deep rich flavor that’s smoky, nutty, and just gamey enough to know it’s wild. Being the generous chap that I am I thought I should share the recipe so will know what to do the next time you find yourself in this all too common situation of having too much grizzly bear meat and beer. Many sausage recipes call for 2oz of liquid per pound of meat, but using water means you are missing out on an opportunity to add an additional layer of flavor. Beer or wine can contribute nuanced complexity, and a dark malty beer will add hints of flavor that stand up to the smoke, while pulling the other flavors together. 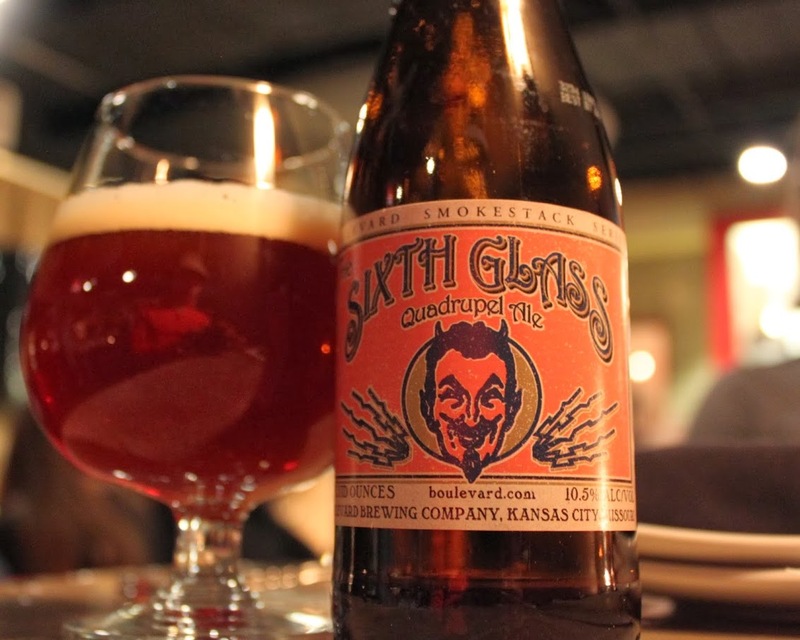 Also, “The Sixth Glass” has one of the best names ever, which comes from Hans Christian Andersen’s short story The Watchman of the Tower. In this story the main character explains what dwells in each glass during a night of drinking, “In the sixth glass sits the Devil himself; he is a little well-dressed man, most charming and pleasant. He understands you and agrees with everything you say. He even brings a lamp to light your way–not to your home, but to his. There is an old legend about a saint who was ordered to experience one of the seven deadly sins. He decided that drunkenness was the least of them. But as soon as he got drunk, then he committed the other six sins.” How could I not love this beer? Making homemade sausage is a simple process with the right equipment. I use a KitchenAid with a meat grinder attachment for grinding the meat, along with a dedicated stainless steel sausage stuffer. You don’t have to buy expensive sausage making equipment though, just hunt around online and you’ll find methods that use everything from funnels to caulk guns. If you own a KitchenAid then the meat grinder has a sausage stuffing attachment that is a cheap and simple solution for making homemade sausages. The next piece of equipment you’ll need is a smoker. I’ve used my grill as a smoker by putting wood chips into foil pouches, but for this one I borrowed some space in a buddy’s smoker. NOTE: You can skip the curing salt if worried about nitrates, you just won’t get the red smoked sausage look. 1. Cut the bear meat into pieces just large enough so that they all fit in a gallon freezer bag or a non-reactive bowl with a lid. 2. Poke holes in the meat pieces with a fork. Place the pieces in the plastic bag or non-reactive bowl, and add just enough buttermilk to cover. Seal and place in the refrigerator for 3-4 hours, then drain and replace the buttermilk. Leave in refrigerator overnight. 3. Drain the buttermilk from the bear meat and pat dry with a paper towel. 4. 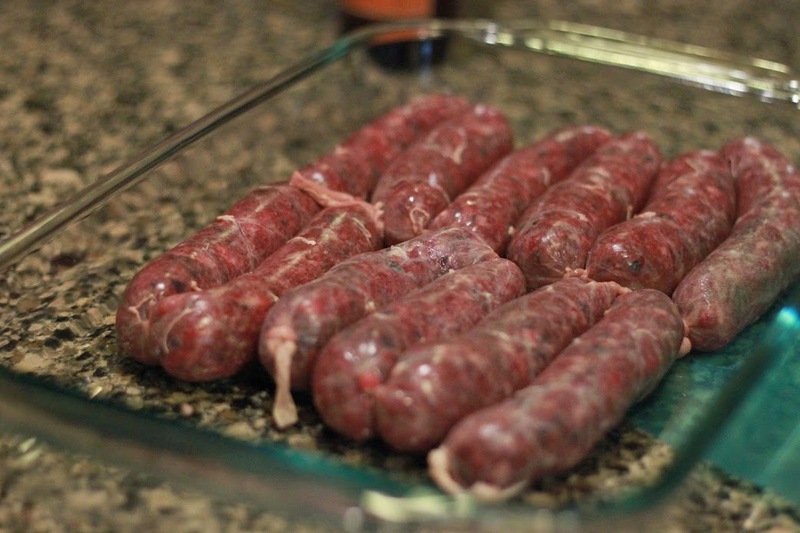 Prepare the sausage casings by soaking in warm water for about 30 minutes. Then rinse the inside and outside of the casings with warm water to remove any remaining salt. Finally, mix one cup of warm water with one tablespoon of vinegar and let the casings soak while you prepare the sausage. 5. Cut the bear and the pork into 1-inch cubes and mix the meat, cranberries, walnuts, coriander, salt, pepper, and curing salt thoroughly in a large bowl. Place in the freezer for 30-45 minutes to firm them up before grinding. 6. While the meat chills, cut the fat into 1-inch chunks and grind them through the fine disk of a meat grinder. Place the ground fat in the refrigerator. 7. Grind the meat mixture through the coarse disk of your meat grinder. 8. Thoroughly mix the meat, fat, beer, mustard seed, and onion. 9. Stuff the mixture into your prepared sausage casings. Twist the sausages into links about 6-8 inches long, but do not separate them. 10. Place the sausages in a large casserole dish or platter and leave in the refrigerator overnight to firm and mature. 11. 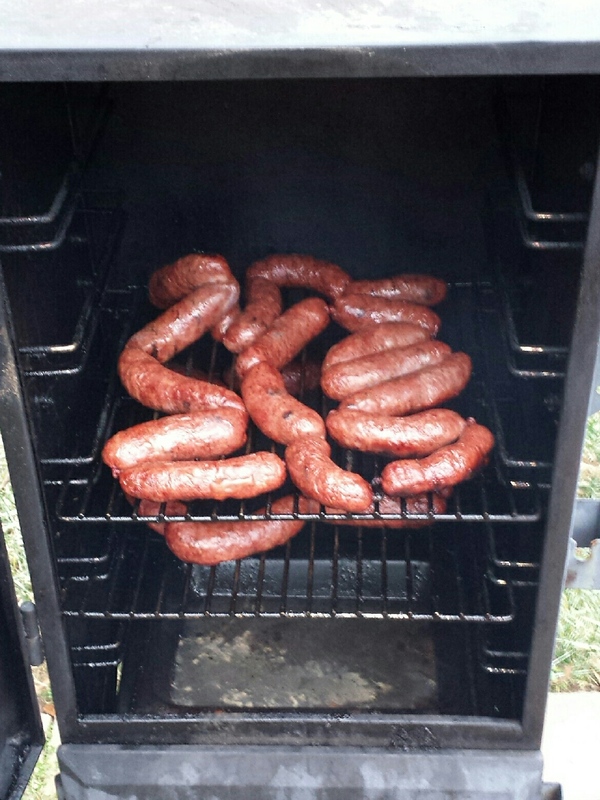 Smoke the sausages at 170-180F for about four hours, making sure they reach an internal temperature of 160F. Reaching a temperature of 160F is especially important with bear meat. 12. Eat immediately, store in a fridge for up to 3 days, or freeze for several months. I write about beer, food, and beer related news when I feel like it. Most of the focus is on Europe. Thanks! And it’s a pretty delicious one too! Enter your email address to follow The Beer Spy and receive notifications of new posts by email.